David Mamet is an American playwright who is known for his work in both theatre and film. For theatre, Mamet’s works include Glengary Glenn Ross, Oleanna, and Speed-the-Plow. Mamet has also written the screenplay for many memorable films, including Hannibal and Heist (which he also directed). John Malkovich has most recently been seen in the Netflix film Bird Box, with his other films including Of Mice and Men, Johnny English, and Dangerous Liaisons. Malkovich’s performances in both Places in the Heart and In the Line of Fire earned him two Academy Award nominations. 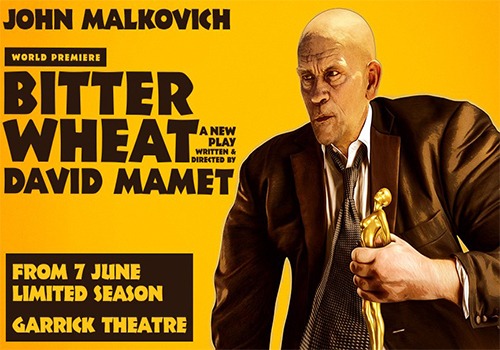 Bitter Wheat will mark Malkovich’s return to the stage after 33 years. The play also stars Doon Mackichan (Smack the Pony, Knowing Me, Knowing You) as Barney’s assistant, Sondra, and Ioanna Kimbrook, who will make her debut performance in the role of Yung Kim Li. Further casting is to be announced. Bitter Wheat is directed by Mamet and designed by Christopher Oram (Photograph 51, Peter and Alice), with lighting designed by Neil Austin (Company, Harry Potter and the Cursed Child). Oram and Austin are both Olivier Award-winning designers. Bitter Wheat runs at London’s Garrick Theatre from 7 June – 14 September 2019, with an official press night on Wednesday 19 June.